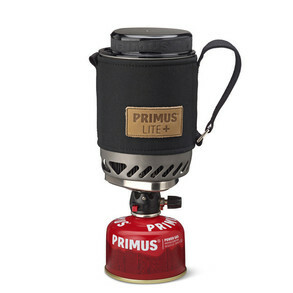 This Primus stove and all accessories, including a 100-gram gas cartridge, fit into the 500 ml hard anodized aluminium pot. For 2015 Lite+ comes with a new heat resistant sleeve in durable G-1000 with felt lining. The sleeve also features a webbing handle with the added ability to use the stove hanging. The lid cuts cooking time and keeps all the parts securely in place in your backpack – and can also be used as a mug. Lite+ includes a foot support for added stability on uneven surfaces and a suspending cord. Lite+ comes with 3 studs which make it possible to use other pots. Gas is not included.